The player sticks for Box Lacrosse, like hockey, are available from basic, entry level sticks to customized colors, styles and materials. As with other sports, this means a price range from $20 or $30 for the entry level stick, all the way up to several hundred dollars for the customized ones. Players just starting lacrosse will not likely notice the difference at first, but after a few seasons, they will develop a preference for certain styles of stick shafts and heads. Although there are specific Box Lacrosse Helmets, a standard CSA approved Hockey helmet works well for lacrosse. Lacrosse shoulder pads are very similar to hockey shoulder pads, with one exception. Lacrosse shoulder pads have a hard plastic or composite shield to cover the outside of the bicep area. As players get older and the contact increases, this is something that players should have. These are like elbow pads used for hockey, and hockey elbow pads will suffice, however, Lacrosse specific arm guards offer more protection for the forearm that hockey elbow pads. Hockey gloves will work for Lacrosse in most cases. The major difference between hockey gloves and Lacrosse gloves is the "bendable" thumb in Lacrosse gloves. This helps with stick handling and shooting as the players become more advanced. These are specific to Lacrosse and are required to play. These are worn around the waist like a belt and provide impact protection for the lower back and kidneys. This is also an essential piece of gear for playing Lacrosse. The "cup" or "jock" used by hockey players will also work for Lacrosse. However, there are also designs on the market with a flexible side portion of the cup that reduces chaffing while running. This is required in order to play Lacrosse. In fact, there is a penalty for having your mouthguard out of the mouth while on the floor! There are numerous types of mouthguards available, from the ones at local big name stores, to ones specifically fitted by dentists. All generally meet the requirements of Box Lacrosse, but vary greatly in price. These are optional equipment and are mostly worn by younger players. Many new Lacrosse players find that the knee pads help reduce impact to their knees when falling on the concrete floor. The knee pads should be soft and flexible, like a volleyball knee pad to prevent interference with running. This is a very important piece of gear for the Box Lacrosse player. As parents, we obviously want to avoid buying $150 shoes that our kids grow out of on the way to the car, but we don't want to get shoes that will inhibit the player either. A good runner for Box Lacrosse should have tread that provides grip on smooth surfaces (not a skater shoe) and should provide comfort when running on concrete (this can be assisted with insoles). In the West Kootenay Minor Lacrosse Association, the major compnents of the goalie gear are supplied by the association. These include the chest protector, which is similar to those used by hockey goalies, the leg pads, pants, throat guard and the goalie stick. Goalies must still supply their own helmet, mouthguard, shoes and groin protection. 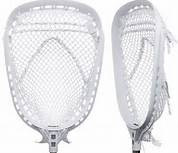 The majority of Box Lacrosse goalies wear hockey goalie helmets and groin protection as they offer more padding than the player versions.